Attention: Small accessories, please keep away from children. ⚡Good Performance Needles: The Needles are made of quality stainless steel， flexible, won’t break, twist easily, this drill bits will clean your printer nozzles and other small parts: throat, feeder gear perfectly. 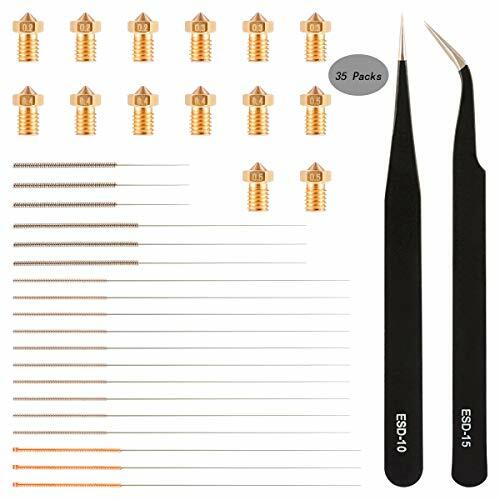 ⚡High Quality Tweezers: Anti-Static, Non-Magnetic Curved and Straight Precision Tweezers; 3D printing tweezers great for nozzle maintenance and cleaning excess support material, great for nozzle maintenance, cleaning up extruder hot ends and cleaning excess support material (PLA/ABS filament). ⚡Convenient packaging: All of the needles come in a neat plastic tube with a screw lid to keep them safely together.